The enterprise world is all about up & downs, and every single business (no matter the size) make mistakes. However, making an error throughout the sales process can be exceptionally catastrophic. You might lose a customer, fail to close an important sale or let potential leads go! Since a lot of the lead’s information is generated through automatic systems, lead scoring isn’t 100% accurate. However, you can improve the quality of your leads by adding job titles and social interests. Then, proceed to divide the different types of leads in groups in your Google Contact Manager. -Click the "Groups" button, then create new. -Enter the name of the group. Selling is much easier when you have an in-depth understanding of the person you’re selling to. If you know your customer needs and can anticipate their problems, your sales call will be a more enjoyable experience. You could spend your sales calls asking several questions. However your customers want you to gather important data about them before you pick up the phone. Remember that if you use a CRM that is compatible with Gmail, you’ll be also to synchronize your contacts’ information in your phone with Shared Contacts for Gmail®! You might be contacting the right company, but if you’re not speaking to a decision-maker then you might be wasting your time... Instead of guessing who makes the decisions,take your time to investigate and put a little extra effort on identifying the key contact. Once you do it, update the information of the contacts immediately! 4. Distribute and coordinate your groups with your team! If there are multiple people trying to reach a prospect, you might all lose it! Why? Communication errors reflect poorly on your company as a whole. This gives the potential customer, an impression that your sales and marketing teams aren't organized enough. Your customers want to feel like they matter and not as if they're just another name on the list. So keep your contact information synchronized across your domain! Doing it is easy; since Shared Contacts for Gmail® is seamlessly integrated with Gmail, it only takes a single administrator to distribute the group of leads. 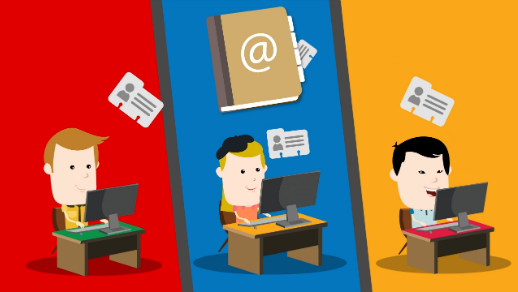 Furthermore, everybody can collaborate at the same time to update each contact with the relevant information! Great contact groups can help to improve your sales process. Take your time to collect and maintain your contact data and you’ll soon see better progress! Contact one of the G Suite Certified Experts from Shared Contacts for Gmail!